Co-operation between the Zoo and the University of Utrecht has enabled extensive behavioural records on the Arnhem Zoo chimpanzee colony to be kept since 1971 according to a standard procedure. Every year students participate in the observations. Research is conducted on many aspects of the chimpanzees' social behaviour. From 1975 throughout 1981 research was co-ordinated by Frans de Waal, from 1981 throughout 1985 by Otto Adang. Milestones in the dissemination of this research are the publication of Bert Haanstra's film "The Family of Chimps (1984) and de Waal's book Chimpanzee Politics (1982, revised edition 1998). Between 1985 and 1989, Lottie Hemelrijk studied reciprocity in the Arnhem chimpanzees. Her thesis contains two worthwhile theoretical articles related to tests of reciprocity and several articles based mainly or solely on data obtained between 1979 and 1989 by the standard procedure in use in Arnhem. Unfortunately, these data are not suitable (too few data, not specific enough, in later years of doubtful accuracy and reliability) for the questions she tries to answer. As a consequence, she consistently comes up with negative findings: reciprocity in agonistic support between males does not result from communication between the males, agonistic support between males is not related to social bonds, the correlation between grooming and support in females is explained as a side-effect of other correlations, higher ranking males do not mate more often than lower ranking males, no relationship was found between the frequency with which a male copulated with a female and her dominance rank, age or parity, etc. 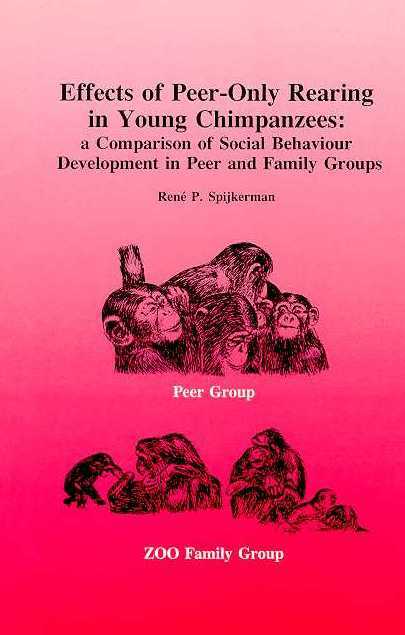 Between 1985 and 1989, René Spijkerman studied the development of 65 young chimpanzees in peer groups at the TNO Primate Centre, Rijswijk and 25 in the Arnhem Zoo chimpanzee colony. 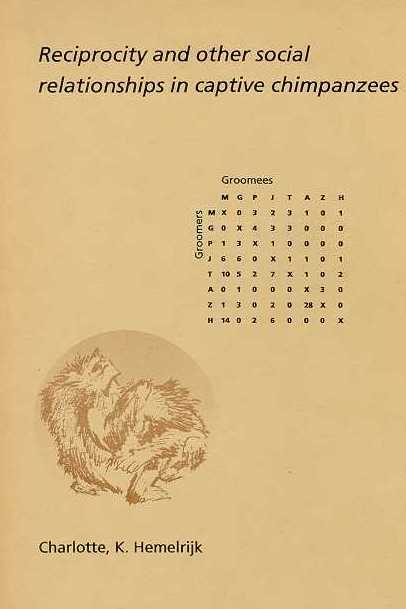 He made use of data obtained from 1981 until 1989 by the standard procedure in Arnhem and 1314 h of focal animal observations. His conclusion is that young chimpanzees are fairly well capable to use peers as a substitute for a mother. This obviously does not mean that separation does not matter. Separation from the mother induces much stress in mother and infant. Anxiety-provoking events probably have much more effect in the absence of a mother as a secure basis. On average, 84 h (minimum 52h, maximum 125h) of observations were made according to a standard procedure every year between May and October. These data are meant as background information, to be able to make basic comparisons across the years. For all other purposes, more specific information had to be gathered during additional observation hours. Every interaction between two individuals where at least one "strictly-agonistic" behaviour element is shown. A conflict is considered ended if there is no exchange of behaviour between the opponents for at least 2 min. Conflicts involving more than two individuals (polyadic) are split up into dyadic interactions. An individual is said to win an interaction if the last behaviour of his opponent is full speed flight or screaming, without any sign of aggression. Hooff, J.A.R.A.M. 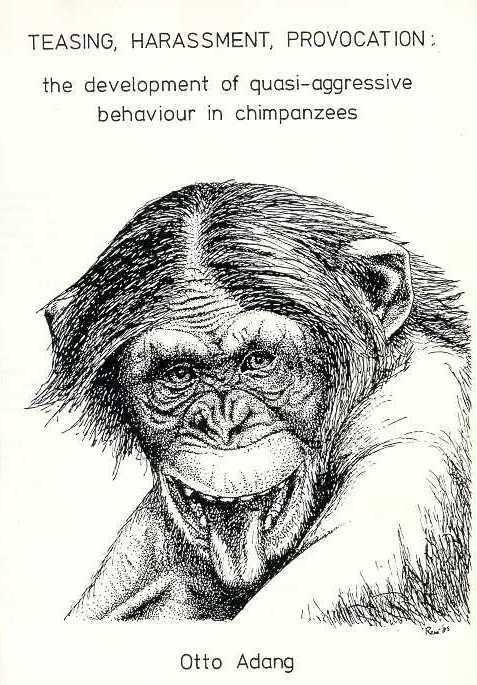 van (1973): A structural analysis of the social behaviour of a semi-captive groep of chimpanzees. In: Expressive movement and non-verbal communication (M. von Cranach & I. Vine, eds). Academic Press, London. Nieuwenhuijsen, K. & F.B.M. de Waal (1982), Effects of spatial crowding on social behavior in a chimpanzee colony, Zoo Biology, I, 5-28.